You never know the lessons you may learn when adopting. The lesson we learned through Andrew’s adoption was a very humbling experience and one that we will hopefully remember for our lifetime. Has God ever called you to something and you refused to listen? That is precisely what we faced before starting Andrew’s adoption. 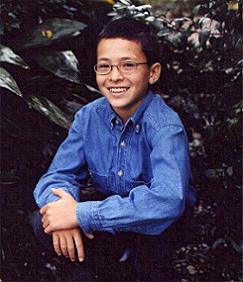 Andrew was one of the 10 children from Petropavlavsk who visited Texas during the summer of 2003. We were the host parents (now adoptive parents) of Abigail. Two days before her arrival, we were asked to pick up Andrew at the airport for his host family. In the chaos of all the excitement of their arrival, I saw the disappointment in the eyes of Andrew, when we did not have parents to introduce him to. I carefully explained to him that his host family would meet us at our house later that evening. It was a long ride home from the airport, but once we were there, the children seemed to get a renewed burst of energy. We took them walking to see all the animals and next door to see Jay’s parents. We had no intentions of adopting either of these children. We were solely host parents!!!! When we took them past the barn, they discovered the bicycles. They became excited and it was soon very obvious that they had never ridden a bicycle before. We spent the afternoon teaching them to ride a bicycle and playing outside. Shortly after night fall, Andrew’s host mother arrived to take him home. Andrew would not look at us and when he did, he had tears in his eyes. We explained to him that he had to go to his host family’s home. We explained that if he did not like it (we knew he would), he could return to our home in five days. I still can’t understand whatever caused me to say this!!! That evening, we were faced with a little girl from Kazakhstan (Abigail) and her Russian/English dictionary!!! At the bottom of our stairs, Abigail confronted me with a plea for Andrew. She carefully found the words in her dictionary and with the help of a little “sign language,” she did her very best to ask us why we were not going to adopt Andrew. She explained that our home was large enough and that we had plenty of beds. She even took me upstairs to show me the bed where Andrew slept. Her compassion for him revealed something really special in her and it made us love her even more. We knew that Abigail was right and that God had blessed us with a home that was perfect for raising this family, but we had no money put back for another adoption and we had no idea how we were going to find the funds to adopt Abigail already. We carefully tried to explain this to her, but it was soon clear that she could not understand. Abigail’s plea made us realize that we were all becoming too attached to Andrew, so we made a couple of phone calls to other families who we thought might be interested in adopting a 12 year old boy. The next day, a family came to visit with Andrew. When they arrived, Andrew seemed to stay outside and would not come in to visit. I knew he was disappointed in us, so this did not surprise me. Looking back, I am so ashamed that we acted this way. I explained to his new host family that he was hurt by us and that he would adjust well in time. Two days later was the Forever Families adoption fellowship. It was held at our home. There was apple bobbing and all sorts of activities. There was a journalist and photographer there from Campus Crusade’s World Wide Challenge Magazine. It was a very busy day! We were also leaving for vacation that evening, after the boy’s hockey game. As we drove up to Connecticut with 9 children in our van, I thought of Andrew often. I thanked God that He had provided an adoptive family for him and we called other families to see how he was doing. 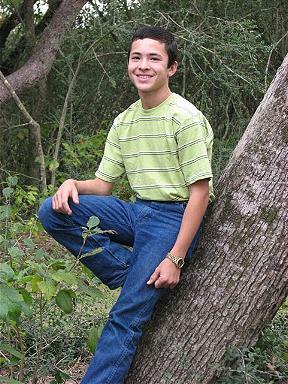 A few days after we arrived in Connecticut, we received a phone call from Wendy Lawhon, explaining that it was not working out for Andrew and his new family. She asked if there was another family he could go stay with. I knew immediately what we would have done if we were at home, but we weren’t. We were half the country away and we weren’t scheduled to return home for another week. It was a very upsetting moment for us. We did not know what to do. Later that day, Wendy called again and said that she had spoken with another family who was considering adopting a second child, but from another region. They were willing to take him and they were moving him to their home that same day. We came to believe that this was God’s plan for Andrew and we rejoiced at the fact that the family was completing the paperwork for his adoption. We knew that there could be some timing complications though, since they were already adopting a child from Almaty, and Andrew was from Petropavlavsk. The children returned to Kazakhstan and we continued to work on the necessary paperwork to bring Abigail h ome. We thought of Andrew often and wondered if we had made the right decision. One day we were talking with the other family about the complications of adopting from two different regions at one time. They mentioned that they were concerned and we worried about this as well. We told them that we had completed our immigration papers for two children and that we loved Andrew so much. After a long, heart-felt talk, we decided together that perhaps we should adopt Andrew in addition to Abigail. The family also felt that he belonged in our family. We thank God for the love they have for Andrew and the love they have shown our family by allowing us to have a second chance at adopting Andrew. In September of 2004, we traveled to Kazakhstan to complete the adoptions of Abigail and Andrew. They are both home now and doing great. 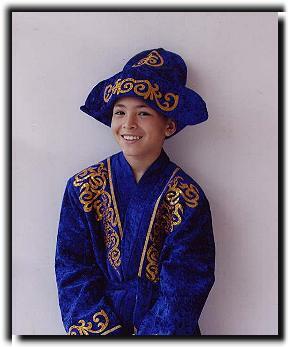 Adopting from Kazakhstan has been far more difficult than any of our other adoptions. We had so many complications and actually started the adoption process over through a private attorney when the agency we were using had some major issues. Abigail and Andrew were definitely worth the wait though! We thank God for the opportunity to raise these two children. Andrew is a very smart young man and has tried hard to do well in school, except for math! J We are still working on that! Andrew seemed to pick up the English language almost overnight. His accent faded quickly and he adapted to the living in the United States very easily. Over the years, we’ve had so me serious challenges in raising Andrew, and there were moments when we just wanted to give up. 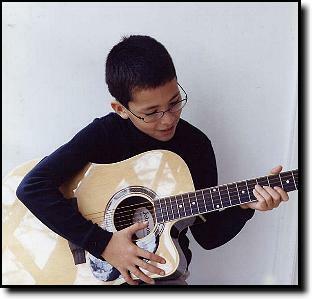 When Andrew was 16, we were at the breaking point, and Andrew spent two months away from home. It was a very painful decision for us to make, but we realize now that it was a life changing experience for him. After Andrew returned, he was a totally different person. His attitude was so much better and he was far more respectful of others. I am so proud of the changes in his life. For the first few years Andrew was a part of his family, he seemed to reject the Lord, but today he is strong believer in Christ. I truly believe that Andrew has found his purpose in this world and is truly settled into his family. 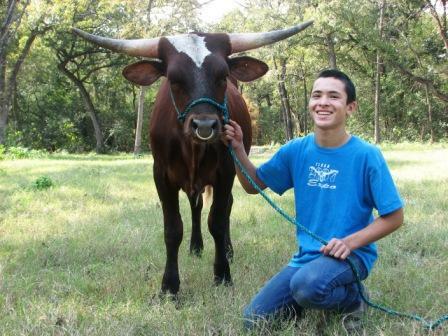 Andrew LOVES showing Texas Longhorn cattle. 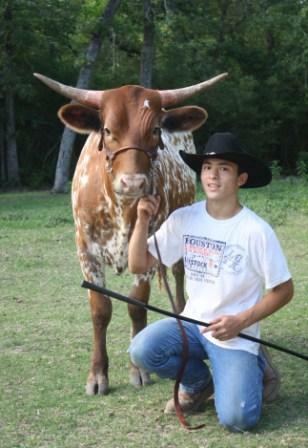 His showmanship skills have greatly improved and he even won his class a few times this year. 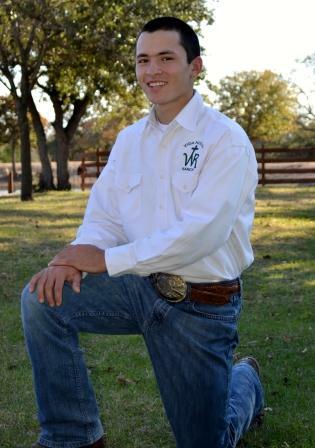 Andrew also enjoys riding horses, especially “Gabby,” and has an interest in roping. 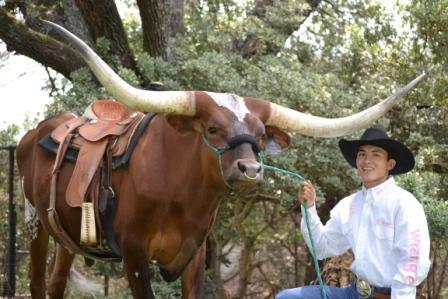 When at the ranch, he almost always has a rope in his hand. 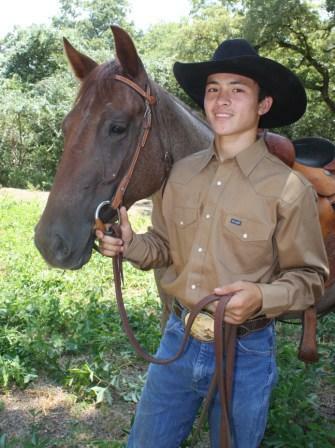 I think that Andrew’s time with horses and cattle has been healing for him. 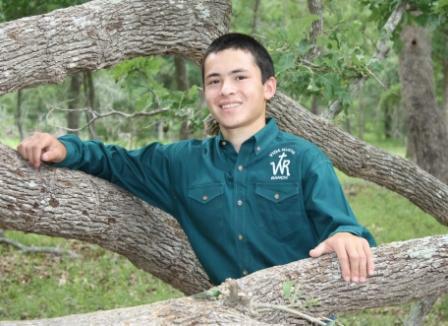 Andrew is working on completing his High School education and is planning to attend Blinn College and later transfer to Texas A&M University. Andrew isn’t sure exactly what he wants to do in the future, but he is considering several possibilities. He is planning to major in Animal Science. Raising Andrew has definitely been a testimony to us of how God can work in someone’s life. We know that we had done everything we could to help Andrew change, but that it was ultimately out of our hands. When Andrew opened his heart to allowing the Lord to work in his life, he became a new person.